Most people enjoy living independently in their own homes for as long as possible. This is usually attainable if you take the right precautions. Falls are the biggest risk to most people in their homes, particularly as they get older. But taking a few simple steps to reduce the likelihood that falls will occur can make a big difference in keeping adults safe at home, regardless of age or health conditions. The bathroom is one of the most common places in the home where accidents can occur. Place safety strips or non-slip mats in the tub to prevent falls. Install a bar in the shower for people to grab on to if they begin to slip; don’t count on unstable soap dishes or towel bars for support. Many people also benefit from a shower seat, which allows them to sit down in the shower. Make sure there are bars near the toilet as well, especially if the senior has problems with maintaining their balance. Unsurprisingly, trip hazards present a major risk for accidental falls. Even being steady on your feet can be no match for rugs that don’t have a rug pad under them to increase their grip. Make sure there are no loose threads or frayed edges. Repair or replace any floorboards that are sticking up. Floors should provide flat surfaces with no obstacles that need to be avoided. 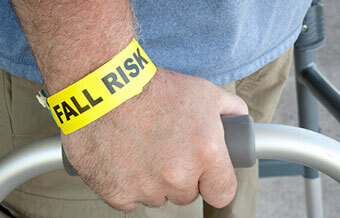 Poor lighting is a common cause of falls at any age. After all, you need to be able to see where you’re going! Make sure that all areas of the house are well-lit. Halls and bathrooms should have a night light or a light switch that glows in the dark. Make sure the light switch in bedrooms is easy to find and located close to the door. Many seniors will also benefit from having a lamp on a nightstand near the bed which can be easily switched on, such as a touch lamp. Pay special attention to stairs. Several problems on stairs can contribute to an increased risk of accidents. Make sure nothing is stored on the steps, which can present a trip hazard, especially in an emergency. Ensure that there is adequate lighting above the stairs. The coverings of the stairs should also be in good shape, with no worn coverings or nails sticking up. Check both the indoor and outdoor steps for safety. Outdoor steps may need reflective paint and a guardrail. Cords for appliances, lamps, and electronics can be difficult to hide. But when they’re out in the open, they can also present a significant trip hazard. Seniors may find it difficult to wind up or hide the cords and as a result, the cords can become a tangled mess. Make sure that someone with good flexibility and range of motion can appropriately sort the cords and tuck them safely out of the way. If you believe your loved one needs assistance in their home, Assisted Healthcare Services can help. We offer Caregiver Services that can help keep your loved ones safe and free from potentially dangerous situations. For more information, please contact the award-winning team at Assisted Healthcare Services, at (800) 949-6555 or www.AssistedCares.com.